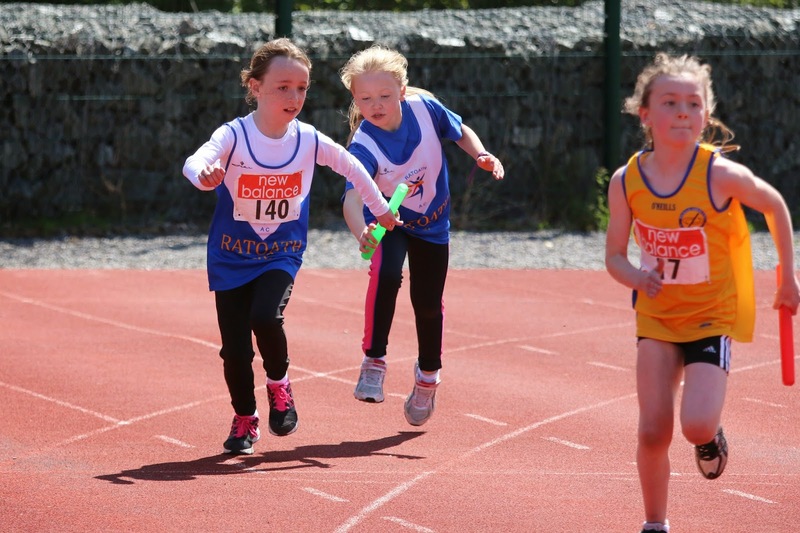 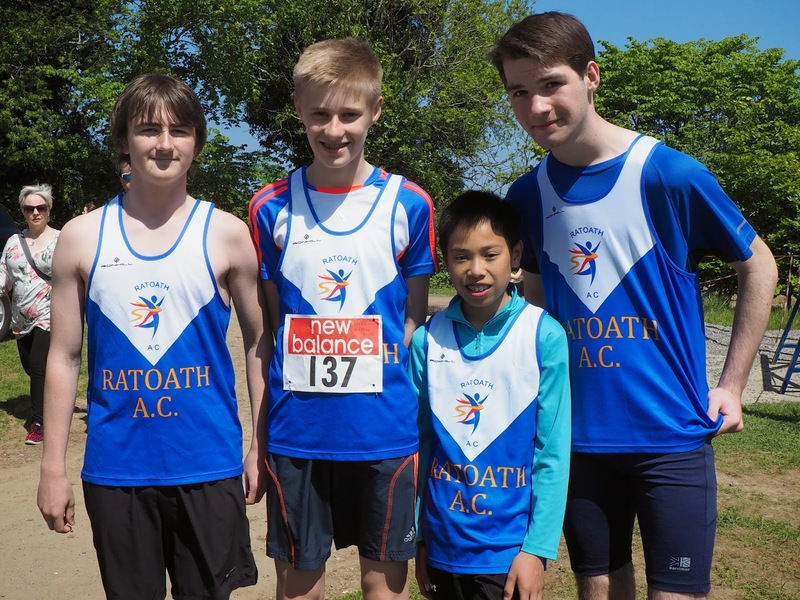 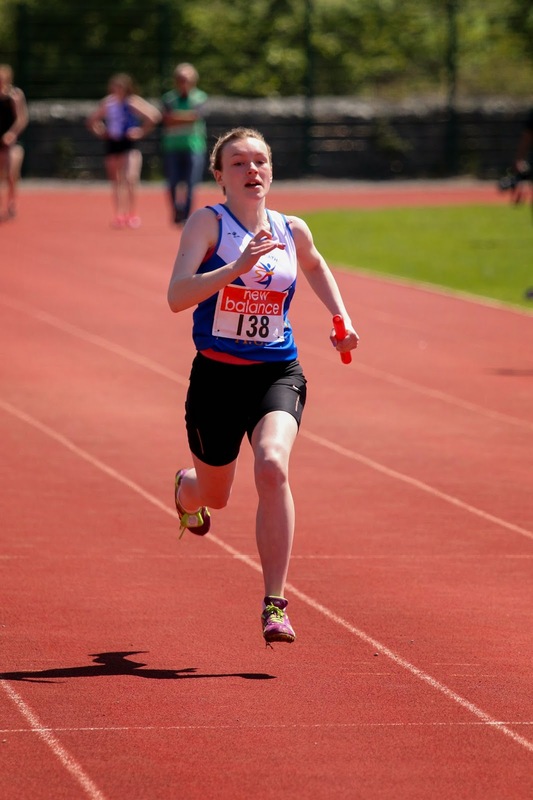 The Leinster juvenile and junior sprint relay championships took place last Saturday at Charlesland; Greystones in what were perfect weather conditions for sprinting. We had 13 teams entered for this event and with some exceptional performances from all of our athletes we brought home a haul of 10 medals on the day doubling our previous best of 5 medals in 2013. 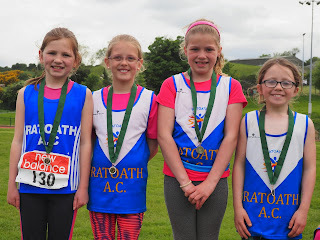 Our u9 boys and girls kicked off proceedings with the girls qualifying for the final where they finished 5th in a very competitive race, well done to Isabel Wallace, Katie Doherty, Erin Lesson and Amelia Holland. 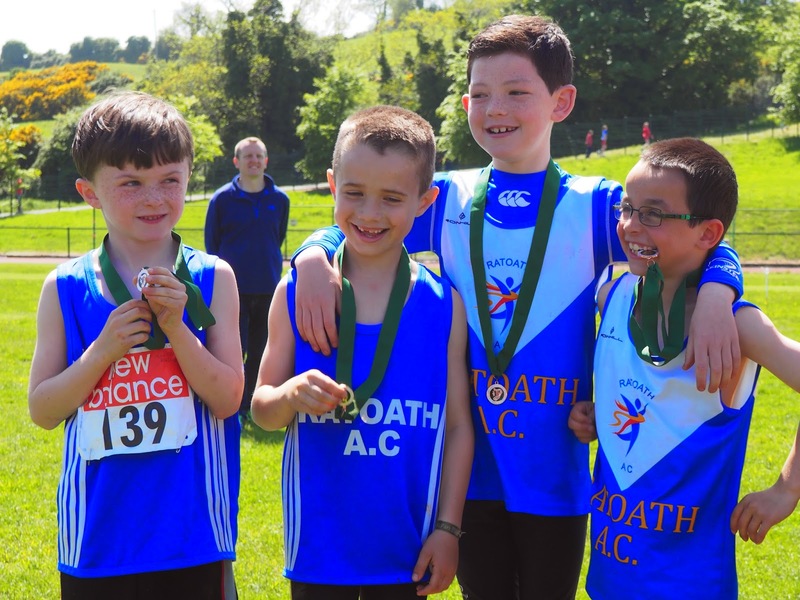 Our u9 boys team of Gavin Witter, Fionn Heffernan, Charlie O’ Connor and Harry Bogan began the medal rush taking bronze in the boys final. We had two teams in the girls u11 event, our blue team Niamh Murray, Cara O’Sullivan, Caoimhe Fitzsimons and Amy Forde placed 4th in their heat but did not qualify for the final, our Yellow team of Laura Kelly, Sophie Quinn, Sophie Green and Aobh Forde finished 2nd in their heat in a close contest with KCH, but the girls pulled out a top drawer performance in the final to take the title in another close race with KCH. 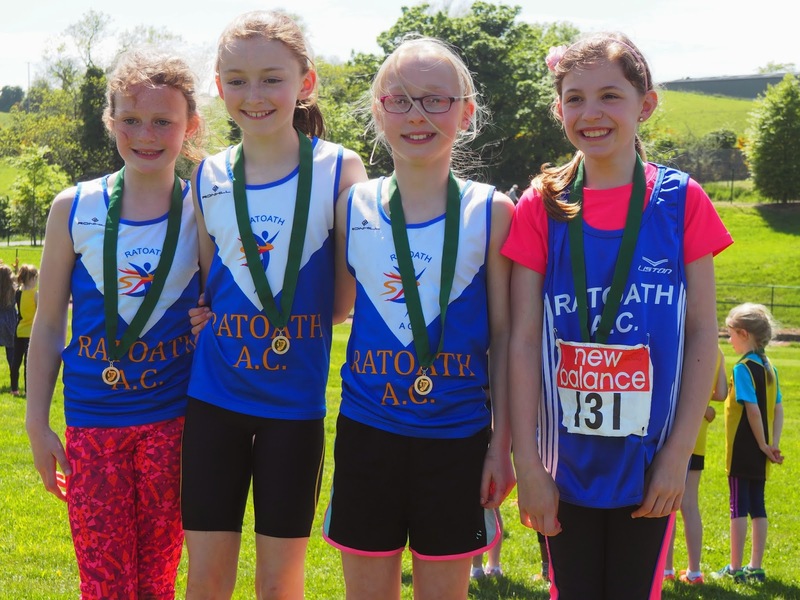 Our u13 teams were up next and both boys and girls teams qualified for the final, Our u13 boys team of Kyle Witter, Oisin Kelly, Fionn Drummond and Tom Kilgannon battled all the way in the final finishing 5th, Our u13 girls team were up against it from a very strong Tullamore Harriers team, our girls ran a great final and were narrowly beaten into 2nd place. Well done to Aimee Doherty, Emma O’Connell, Aoife Rutherford, Ella Healy and Lili O’ Connor. 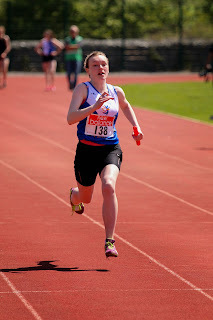 The u15 girls as usual put in another great performance with a powerful run from Aine Cooney to bring the girls into 2nd in the final, the girls ran another senior club record of 52.10s, an exceptional time for 14 years old girls, congratulations to Aine Cooney, Emma Coroner, Ivie Okome, Maria Rogers and Lara Power. Our u15 boys team of Kevin Conway, Matthew Buckley, Daragh Casey and Fergal Kilgannon put in a terrific performance also with a great battle on the final leg, Fergal Kilgannon holding on for 3rd in a photo finish. With 5 medals from the morning session we looked forward to the even age’s event in the afternoon. 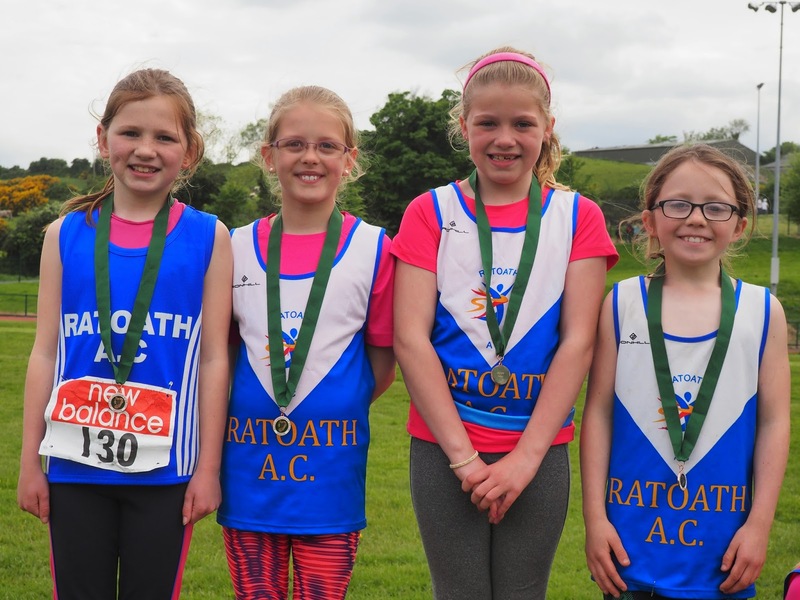 Our u10 girls team of Ciara Coroner, Cara O’Sullivan, Caoimhe Fitzsimons and Niamh Murphy were first up finishing 2nd in their heat and with a great run in the final they placed 3rd to take our 6th medal of the day. 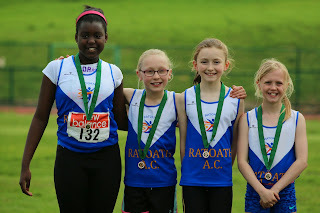 Our u12 girls who were not expected to medal ran out of their skins winning their heat and finishing 3rd in the final, with a little more practice this team could do very well at Nationals, well done to Aimee Doherty, Sophie Quinn, Laura Kelly and Eno Okome. 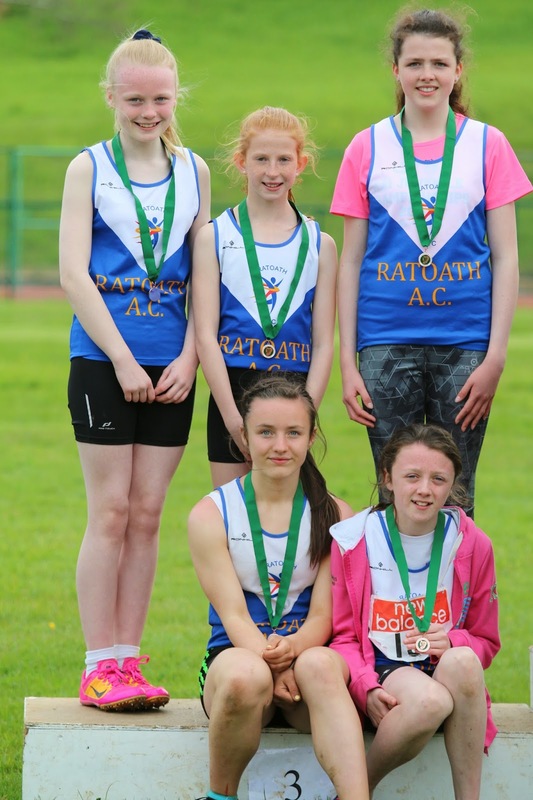 Our u14 girls just scraped into the final taking the last fastest loser spot, but that did not deter them and with a powerful run from lane one they finished 3rd in a blanket finish, this was one of our best performances of the day, great credit to Kate Smith, Lili O’Connor, Rachel McPartlin, Emma Coroner and Aoife Rutherford. 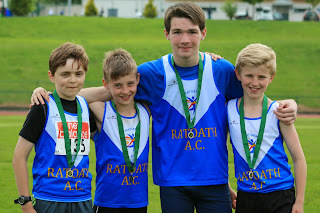 Our u14 boys’ team put in another great performance to claim our second Leinster title, after a comfortable win in their heat the lads put in a faultless display of baton changing and sprinting in their final to take the gold with a great anchor leg from Adam Quinn. 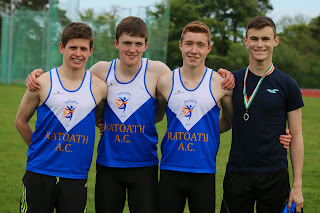 Our 10th medal of the day came from our Junior men’s 4 x 400m team, the lads ran a new club record of 3:35 finishing 3rd with great running from Brian Kiernan, Ciaran McCarty, Daryn Browne and Philip Marron. Thanks to all athletes and parents who made the trip to Greystones and we look forward to more success at Nationals in June and July.